If you're using Excel's "Scaling" feature to automatically size a spreadsheet to fit the dimensions of a printed page, you may have a problem where the page is printed much too small. Both print preview and the printed speadsheet do not fill the page, but instead appear as a small thumbnail or in miniature size rather than filling up all of the available space. This can be caused by the "print titles" feature in the page setup window. 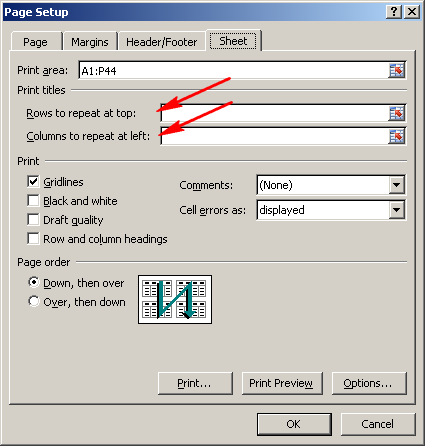 Because this repeats specified rows and columns on every printed page, Excel prints the rows and columns specified even though they may be blank and excluded from your print area. To clarify, you need to erase the values in the "print titles" fields so that the rows and columns are not repeated on every page. If you don't see anything in those fields, try putting in a single space so that it erases whatever might hidden in that field. Or maybe your page layout is different for some pages?